I’m Marisa - a photographer and entrepreneur. This monthly writing is about what it’s like to be a 30 year-old starting a photography business, with serious mission. This photo of me was taken by Dave Zahrobsky, a participant (and now my friend) who joined my Alaska expedition this past September. Boy, we had a blast out there. We all walked alongside grizzly bears on a secret island, photographed the Aurora Borealis in the Prince William Sound, and so much more. So naturally, we're doing it all over again this September! Join our expedition this year! Thanks for the cool pic, Dave! Dave lives in San Francisco and travels all over the world. Be sure to check out his photography at www.davez.net and drop him a note next time you're in his neck of the woods! I took this photograph around 1am during our Alaska photo expedition. The Aurora Borealis on the Prince William Sound! Good news! The entire duration of the eclipse is visible for those in North America! Here's everything I think you need to know. For my fellow Floridians in West Palm Beach (WPB), it looks like we're going to have great, clear skies! Below are our conditions. For those not in Florida, visit this link for details (and a chart) specific to your area. The eclipse does not begin until 9:30pm ET, but I highly recommend you get out there for moonrise and wait until a bit after the moon has cleared the horizon (around 5:30-6:30pm) and start photographing it as it starts lining up against rooftops and trees. The juxtaposition of the super (large) moon amongst those objects will make for a great treat! You can set up a city scape scene with a wide-angle lens (focused on infinity). Set an intervalometer to continuously fire every minute or so, capturing the full city landscape amongst the progression of the lunar eclipse. In Photoshop, layer these images together to place all phases of the moon in one city scape! You can set up a telephoto lens (70-400mm range) and take individual shots of the eclipse for superb moon detail. Remember to move your lens between shots, as the moon is on the move and will eventually move out of your frame! An oddly pink moon I captured recently. Every month I try to bring something new to my photography Meetup group. This month, I had the pleasure of working with Ed More and his fascinating Cognisys controller system to bring exciting high speed photography to my group. What's interesting is that, in this type of high speed photography, the flash is the exposure, because you're shooting these high speed actions in utter darkness. With Ed's equipment, he syncs his (gorgeous) Profoto lights to the same control system that can "see" or "hear" other things (like the sound of a drill, or a drop of milk, etc.). When the system hears the drill, or sees the drop pass through a synced laser, it then fires the flash at a set time relative to that pre-action (say, 1/100th of a second after the milk drop passes the laser and is on its way down to a bowl of milk). So long as your camera is firing for about 0.5 to 2 seconds (in darkness) and this action happens in a shorter interval during that time, bam, you got it. We had a number of people show interest in another class. If you are also interested, send me an email and we can gather enough names to set up another! There is not much you have to do in editing these high speed photos. I pulled up the saturation of the blue light in this image. I dipped this rose in both yellow and red paint. 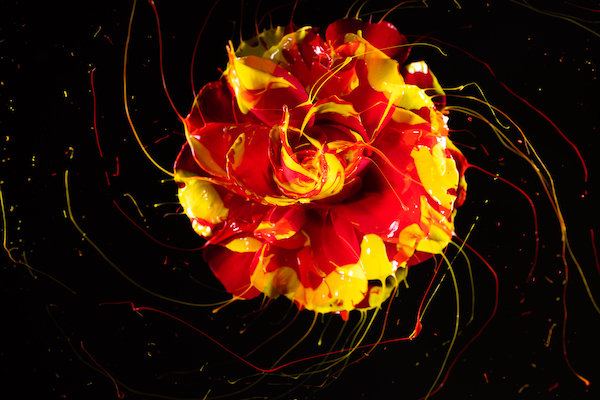 You can tell the drill was rotating quite fast here, which opened up the rose and splatted more paint around. You should see how beautiful the box that housed this experiment was after everything was over. It was covered in all types of paint colors and runaway rose petals. Keep an eye on Ed's latest experiments with high speed photography at edmorephotos.com. My favorite part of my career! Nothing beats leaving everything you know, transporting yourself to an incredible place, and awakening your photography in a whole new way. Here we go! I am releasing two amazing new photo expeditions that are going to take place this fall! Don't have any plans to fuel your photography this fall? Now you do! Reds, yellows, greens and bright blues… ignite your photographic passions as we capture the fiery colors of geysers and foliage, study wildlife behavior of bears, bison, and more. The vibrancy of color and life is calling to you. Join us on this retreat-worthy refresh of your photographic eye and inhale crisp air like never before. They were so great, we're doing them all over again. Join us! I am well aware I sound like a broken record when I say: I love writing. However, it's much easier to write personally; when it comes to writing a piece for the public, things get heavy. I try hard to make sure my message is conveyed properly to the world, that I'm saying what I want to say, that I'm making my publisher happy, that my message isn't shorted by a word limit or a particular target market. So it is a welcomed, true challenge and honor to have these opportunities to be published. Getting my voice and photography out into the world is a dream come true. In February, a photoessay I put together about my time running a photo expedition in Alaska will be published in the gorgeous pages of INK Magazine. Stay tuned to INK's website as the feature will hit there about a week before print. In February's newsletter, I will attach the direct link. Thank you, sincerely, Jeff and Angela at INK Magazine! This month I retreated to my cave (office) to undergo the application process of becoming a Registered Seller of Travel in the United States. For those of you who have been on my trips, you know that you have needed to submit your payments to a travel agency (due to applicable travel laws). This new registration will allow my business to become the 'seller of travel' and I will be able to accept payments directly, no longer needing to funnel through a travel agency as a third party. This will help grow my expeditions to create a network of trusted and talented photographers who will run photography expeditions as part of my company. I am so excited about the opportunity for growth this will bring over the years, and I'm looking forward to getting an in-house coordinator who will plan all of our trip logistics to the T! Another lesson I learned over the course of last year (both professionally and personally) is: let go of projects that are not serving you. Doing so creates space for those that will serve you. It is a hard thing to let go after all of the effort you've invested thus far, but try to envision what things would be like if you freed yourself from this situation, what greater good could come to you, your clients, your colleagues and the future. My advice is: Know your mission, always (and keep checking in on it to make sure it is still clearly your mission). Then you will be able to see that each little project is only a piece, and does not make your entire mission or goal. If you are considering letting go of a project to create space for a better one, ask yourself if your mission will still thrive without this particular project. And if it will (9x out of 10, it will), go forward! Me and a client on Moab expedition May 2018 - photo credit Dan Barry. My interest in astrophotography is growing so rapidly. A couple of nights of photography under the Milky Way and subsequent successful images will hook you. This week I finally purchased a Sky Watcher Star Adventurer equatorial tracking mount (note: you have to purchase the base and counter wait separately). This will allow my camera to move with the rotation of the Earth, locking on to a particular region of stars. The end result is that this offers longer exposures of the Milky Way than what you'd normally be limited to with just your camera and lens (about 15 seconds), and when you expose the Milky Way long enough (over a minute), lots of magical things start to appear (more color in the sky, more light gathering, etc). This type of tracking mount is a lot smaller, lighter and more portable than a typical equatorial mount that would come with a telescope (I'll be getting one of those later ;-)), so I believe this is the best next step forward into the astrophotography world. Telescopes and deep space objects (DSOs) will come soon enough! I will keep you posted on my adventures with this new device set to arrive next week. Milky Way season doesn't start for another couple of months, but this will give me the time to play with the device and get comfortable so I'm not overwhelmed during MW season. Tip: Learn your gear before you're in the high-pressure moment of needing to use it. I'm working on building more expeditions with some really incredible photographers. One is somewhere very cold in the landscapes of icebergs and penguins! The other is somewhere very tropical, with volcanoes and stunning vistas! This Spring, I will be in the midwest scouting locations in New Mexico, Wyoming and Utah. Looking forward to having you join me sometime out there! Email me your latest questions and I’ll pick one to answer for next month! Can be about anything related to photography, entrepreneurship, travel, etc! Space limited to 10 participants to ensure each person has an unforgettable experience. Spot can be secured with 30% deposit. Me and a client on Alaska expedition Sep 2018 - photo courtesy of Rob Lyon. LOVE WHAT YOU'VE READ? PASS THIS ALONG TO SOMEONE YOU BELIEVE IT WAS WRITTEN FOR! Thank you for being a part of our community of passionate people. We believe in following our dreams, expanding our horizons, and helping the world along the way. We’ll keep you updated with our latest expedition information, and also occasionally send you some of the best photography tips and other wise musings we come across. Because who couldn’t use a little more inspiration in their lives!? To your travels, to your photography, and to your LIFE! 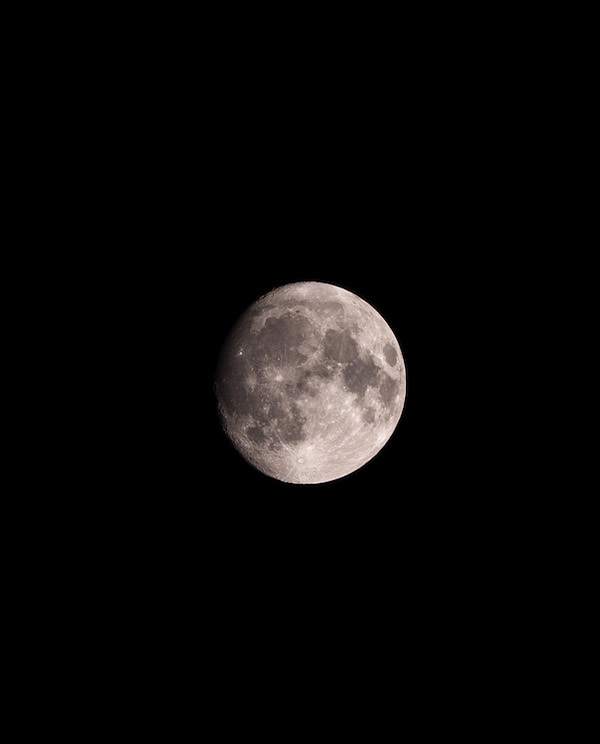 Older PostBeautiful Moon, Show Me Your Craters!